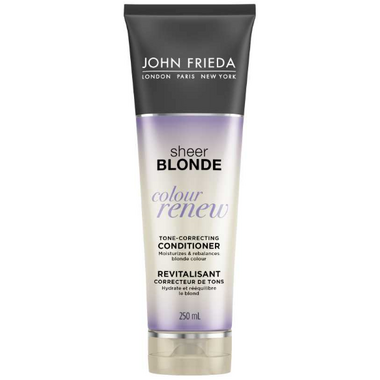 Sheer Blonde® Colour Renew Conditioner neutralizes brassy and yellow tones and helps make colour treated hair appear bright and salon fresh. Makes my hair smell great and feel soft. I think the formula has changed though. I used to buy it in a purple bottle and it worked way better! This barely makes a difference with brassyness. I will switch to another brand. along with the shampoo this does work really great for color treated blonde. Whenever it starts to look a little too yellow I use this and it is good to go!!! i use this conditioner along with the shampoo (which works great!). it leaves my hair soft and silky, and it smells good, not chemical-ly at all! will definitely continue to use as long as i bleach my hair.